This Torremolinos Map shows popular Attractions, Places of Interest & Transport location . Click the name in the right column to highlight the location on the map. You'll never be short of things to do inwith every amenity available including an Aquapark, golf, tennis and ten pin bowling! If you fancy venturing further a field the historical cities of Seville, Cordoba and Granada are well worth a visit. 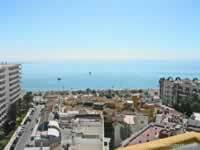 The old town of Torremolinos is built on a high hill with a gentle slope inland. On the seaward side of the old town is a shear high cliff, with houses, shopping centres, hotels,apartments and other buildings built to the very edge, in fact one is supported on concrete stilts. In front of the cliff bottom is a steepish slope for about 200 metres then a wide flat area, location of some of Torremolinos's hotels & apartments. 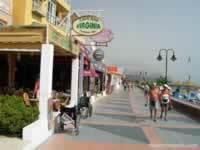 The main street of Torremolinos is the famous Calle St Miguel continues to the beach as Calle Cuesta del Tago. This is a pedestrian only narrow street absolutely packed with mainly tourists and also a large number of locals, not sure if these are true locals or spanish tourists. 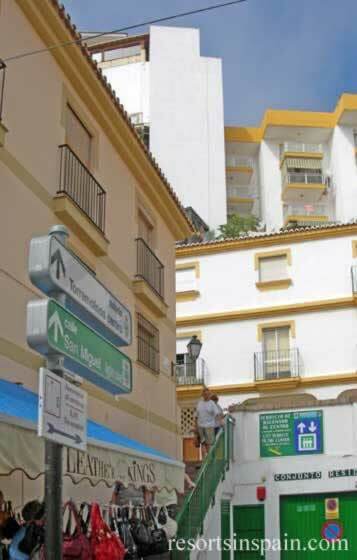 This is also the main route for pedestrians to the beach via either a steep zigzag street, Calle Cuesta del Tago, with lots of slopes and steps or a cliff lift. Entrance to a short tunnel to the lift bottom on the left. 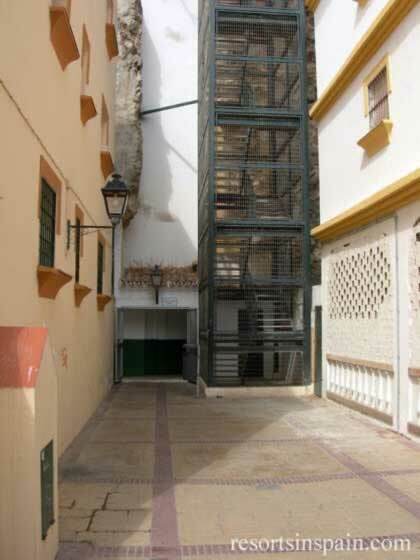 Top Level: The lift is set back from the road Calle de las Mercedes, around 100 200 metres to the east of where Calle Cuesta del Tag alongis a cliff lift (ascensor) €0.50 per journey. Well worth it after a long day in the sun on the beach. 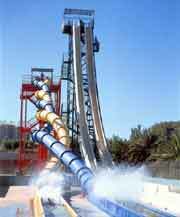 and located about 300 metres from the sea front at the foot of the cliffs. 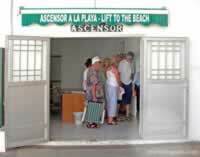 The lift is not easy to see so look for directional signs. 12 kilometres west of Malaga. 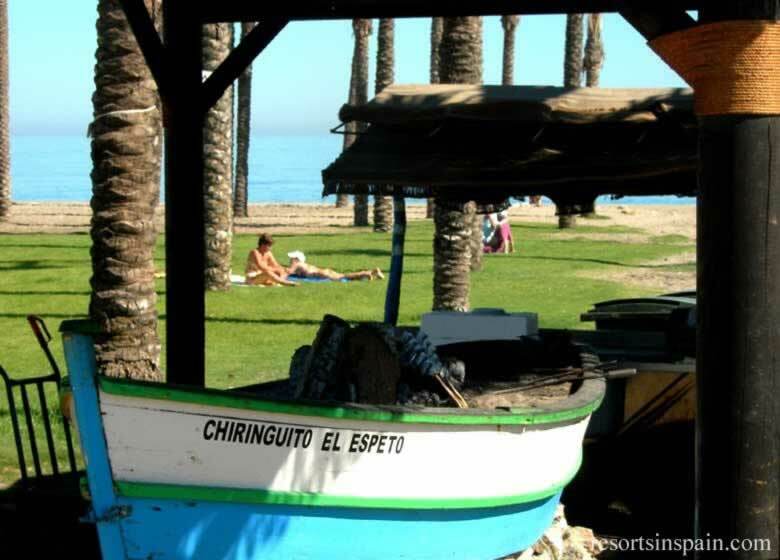 Boisterous, full of fun and noisy in high season, Torremolinos stretches for seven kilometres along the coast on either side of a rocky headland. Nothing is very far from a beach of golden coloured sand, where water sports abound in mid summer, especially on the main beaches of El Bajondillo and La Carihuela. The stretches of golden sand are interspersed with outcrops of rocks. 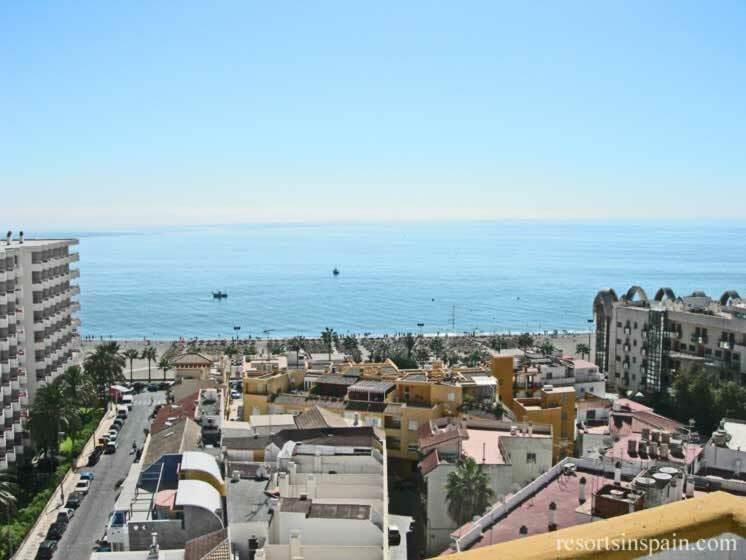 It was this large beach and the building of the big luxury hotels in a small quiet fishing village of Torre Molinos, named after it's flour mills, that started the mass tourism industry, for the working man, to Torremolinos in the 1950's. 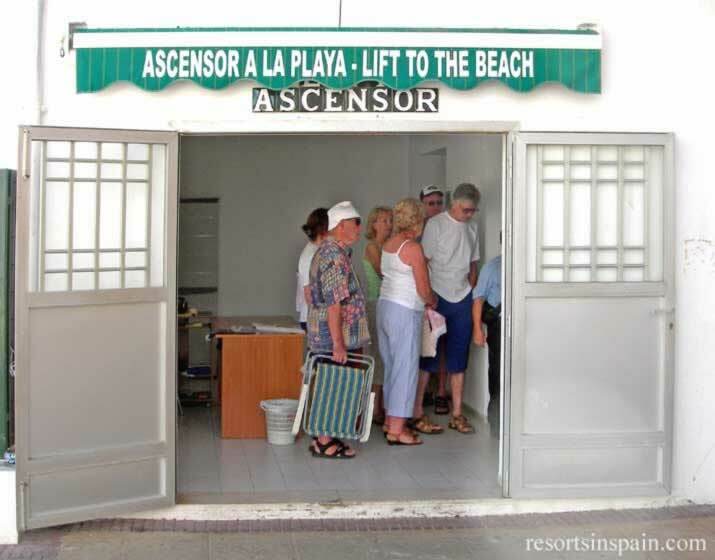 Mass tourism rapidly spread to other resorts in the area and the rest of Spain. 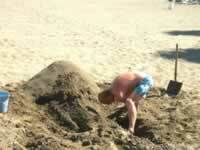 A selection of beach games, soccer and volleyball is available. 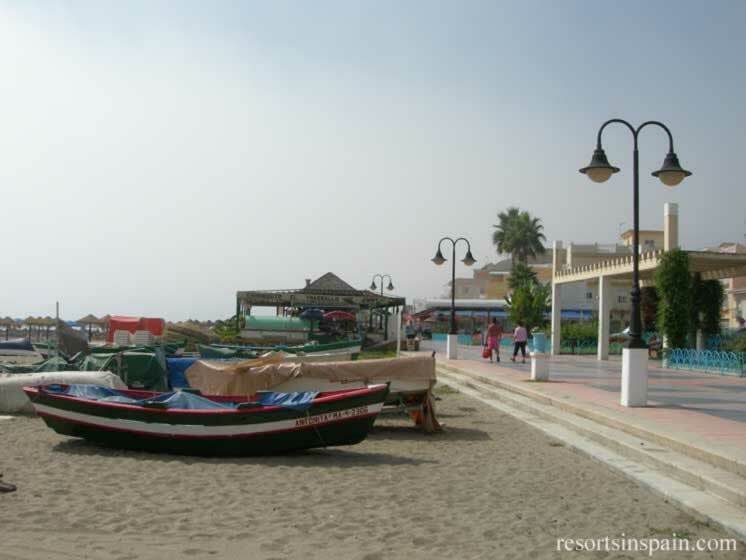 Besides the on beaches a greater variety of water sports is available at Benalmadena Marina at the nearby next door resort. The sand artists can be found at intervals all along the beach imediatly in front of the promenard for maximum audiences, many throw money into the collection area. On the above 2 beaches the demand for the sun loungers, beach chairs, and sun shade umbrellas that can be rented is very high in high season. Arrive early for the best spots on the beach. 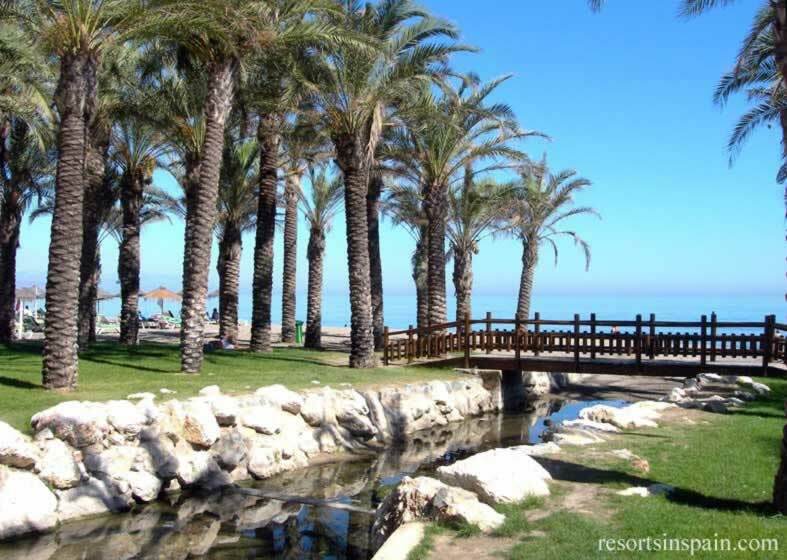 Beyond where the sea front road ends at Los Almos continue on the beach to where the golf courses are and beyond towards Guadalmar you will find a naturist beach and further along is a gay area of the beach. 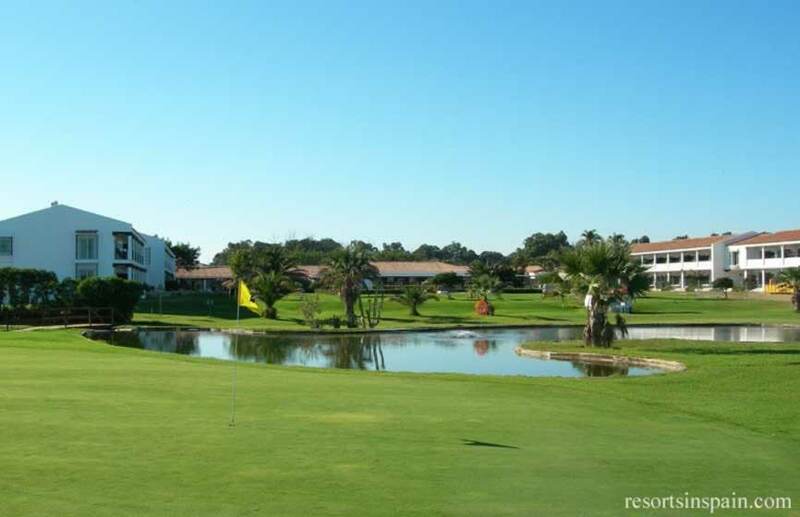 By road look for signs to Parador de Golf or Guadalmar. 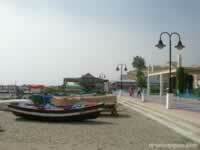 Torremolinos has a beautiful 7km sea front promenade running along along the beach. There's plenty of opportunity to stock up on souvenirs with many shops dedicated to the tourist. It would also be a shame to miss the market which takes place every Thursday morning near the old part of town known as "El Calvario". With hundreds of bars and numerous clubs, the nightlife is partly what attracts so many visitors to Torremolinos You'll never be lost for somewhere to go when the sun goes down, with the partying non stop until the early hours. As you'd expect of a busy tourist centre, Torremolinos has a host restaurants catering for every taste. 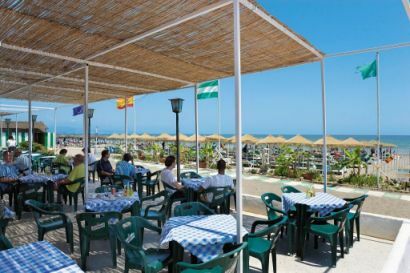 If you would like something slightly more exclusive visit the Carihuela area and try some of the fish specialities and tapas dishes. This fabulous magic show has had to stop in it's 80 million euro venue, Palacio de la Magic, due to financial problems, but in true show business style "The show goes on" in it's new venue at Torrequebrada Hotel in next door Benalmadena Costa under the name of International Magic Show by Oscar, Renzo & Mara. Old Town Rail Station is the main station and is located in , in the centre of the old town in Avenida Jesus Santos Rein. 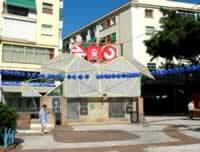 The station entrance which looks like a kiosk is located in a large wide square, see photograph above. The station is situated underground and is very similar to a London tube Station. The other 3 stations are normal ground level 2 platform stations. 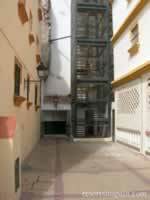 La Colina Rail Station and Los Alamos Rail Station are located to the East of Torremolinos Old Town. 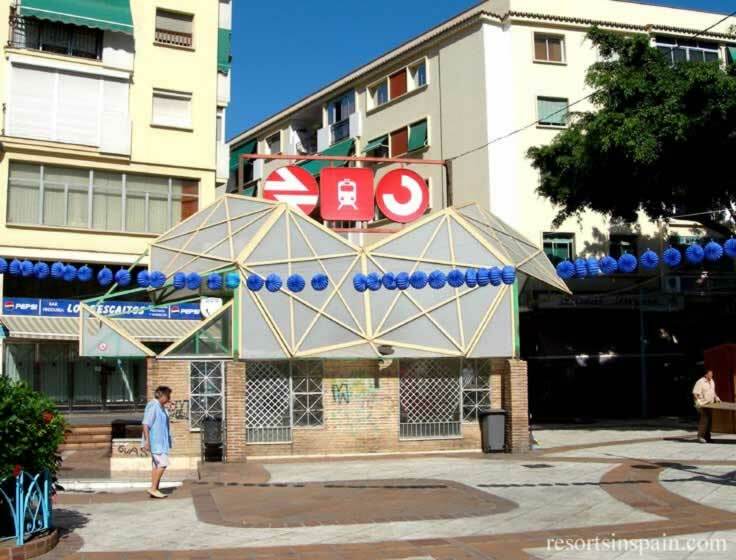 The bus station (Terminal Autobus) is located in Calle Hoyo, a one way street, therefore buses traveling to Malaga byepass the bus station & travel along the next street closer to the coast, Calle de la Cruz. The bus stop is in front off Centrol Cultural Pablo Picasso. When getting on a bus at a bus station, sometimes you have to buy your bus ticket at the bus station, and other times you can get it on the bus. 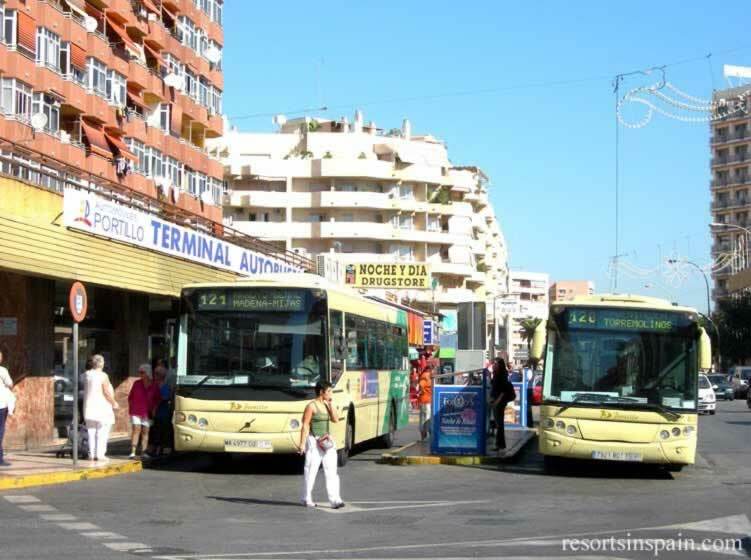 There are several buses a day from Madrid and frequent bus services from the nearby towns and cities. Daibus service use the Routes & Timetable (Rutas y Horarios) Link for useful information. Although in Spanish these pages are reasonably understandable. Alsina Graells is an Bus service serving Andalucia.